There you are, working hard on your project, and you realize that the next scene calls for a medium shot of a pilot and co-pilot flying in a World War I Navy seaplane. "Oh great!" you say to yourself...or something slightly more colorful. "Whose idea was this?" Regrettably, you remember: It was yours. You know there's no money in the budget to hire one of those big stock footage companies to research it for you, let alone pay the additional hundreds (if not thousands) of bucks in dubbing and royalty charges to cover those 15 seconds of narration. So, what do you do? One option, of course, is to rewrite the scene. Or, you could find the footage yourself, costing you as little as the price of a videotape and some of your time. If you have a little more time than money, you can search through the thousands of motion pictures produced by or donated to the federal government and held within America's film vault: the National Archives. Overall, there are more than 108,639 motion picture titles, and they are all available to help solve your stock footage problem. The National Archives and Records Administration (NARA) has amassed one of the largest, historically rich documentary film collections in the world, thanks to the Federal Records Act. This, and other regulations, defines motion pictures made under the auspices of government agencies as federal records. Agencies are required by law to transfer their non-current and retired records to NARA. In addition, since it opened its doors in 1935, the National Archives has had the authority to accept donations of films that relate to America's history from individuals, organizations, production companies and even the major television networks. As a result, NARA has acquired over 360,000 reels of film dating from the 1890s to the end of the 20th Century. In total, these moving images are part of the 350 federal and donated motion picture collections within the Archives. 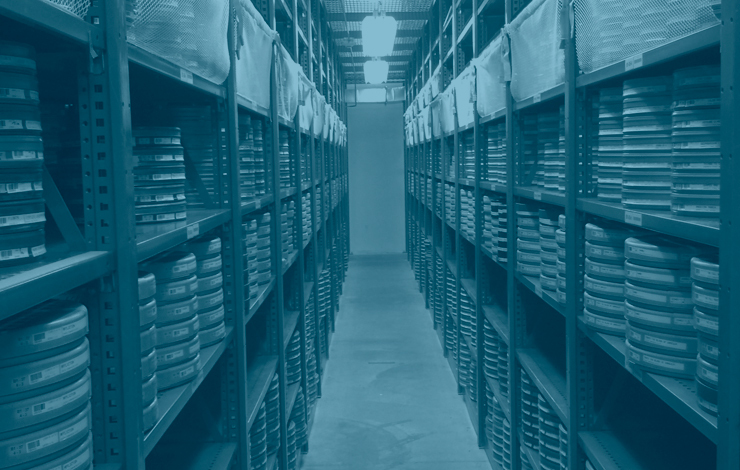 Approximately 95 percent of the films are in the safekeeping of the Motion Picture, Sound and Video Branch of the Special Media Archives Services Division, located at Archives II in College Park, Maryland. Those that remain are housed within the National Archives' Presidential Libraries located around the country. The collections held within NARA are part of a federal agency's specifically assigned Record Group (RG). These RGs normally consist of textual (letters, books, documents), graphic (maps, drawings, posters) and photographic elements. If motion pictures are included within a particular RG, they predominately consist of edited documentaries. However, educational, informational, instructional and newsreel films make up large portions of the overall collection. There are a few theatrical released titles as well. Most of these films were made, or acquired by, Uncle Sam and are free of copyright. They are also royalty-free. However, there are a small number of films that do have copyright or use restrictions--particularly within the Donated Materials Group (DMG) collections. The Motion Picture, Sound and Video Research Room staff is available for clarification and guidance. Before I go any further, allow me to give you an idea of the vast scope of the motion pictures available to help you satisfy your stock footage needs. In the interest of simplification, I have divided the RGs containing film into one of three categories: Civilian, Military and Donated. Below is a sample of some of the film titles within each. This category is the largest, with 159 RGs to explore. An early example of the civilian category is The Making of an American (1913), produced by the Bureau of Mines (RG 70), which documents the assimilation of immigrants into American society. A glimpse of the New Deal in action can be seen in Hands (1934), made by the Work Projects Administration (RG 69). Films concerning Civilian Conservation Corps camps, soil and forest reclamation, development of water power, and recreational uses of national parks are shown in films like A Visit to Yellowstone National Park (1937) and Smokey Bear TV Spot: Susie Scout Helps Smokey (1962), produced respectively by the Office of the Secretary of the Interior (RG 48) and the Department of Agriculture (RG 16). Civilian World War II-era films like Joe Comes Back (1943), Family Feud (1944), German Reprisals: Destruction in Greece (1944) and A Challenge to Democracy (1945) document our government's efforts to communicate with foreign and domestic civilian populations. These titles were produced by the War Production Board (RG 179), Office of War Information (RG 208), Office of Strategic Services (RG 226) and the War Relocation Authority (RG 210), respectively. These titles are just a few of the more than 2,100 films within those four RGs. Captured Axis motion pictures, such as Japan in Time of Emergency (1933) and With Our Air Force in Sudetenland (1938), are among the films included in the National Archives Collection of World War II War Crimes Records (RG 238) and the National Archives Collection of Foreign Records Seized (RG 242). Motion pictures from the Department of State (RG 59) deal with US foreign policy and foreign relations issues. The Marshall Plan at Work in Great Britain (1951) is a fine example. There is another collection of 17,000-plus reels of film created for overseas distribution that illustrate the American way of life produced by the US Information Agency (RG 306). Film titles like Pursuit of Happiness (1935), The Country Store (1950), Presidential Nomination (1956) and Music in American Education (1969) are representative examples. The Agency for International Development (RG 286) examines foreign aid, economic and rural development, lifestyles and cultures, and AID projects with films like Kitchen Come True (1945), Giant in the Sun (1957) and Ambassador: The Life and Work of a Man (1979). The US space program is documented in the motion pictures of the National Aeronautics and Space Administration (RG 255). The collection consists of over 11,500 reels of edited and unedited films, including such titles as Project Mercury Western Electric Range Report for August (1960), TR-3268 Fixed Wing Aerial Recovery Demonstration (1967) and Space Shuttle: A Remarkable Flying Machine (1981). Social concerns ranging from housing to poverty are addressed in films like Unfair Housing Isn't Unfair: It's Illegal (1969) and A New Life for Rose: The Program of a Senior Housing Project (1976) and are available from the Department of Housing and Urban Development (RG 207). Motion pictures from the Department of Labor (RG 174) focus on labor-management business relations, unemployment, the economy and job opportunities as seen in films like Pin Money (1940) and Harvest of Shame (1960). The motion pictures produced for the US military services represent the largest (in reels) film collection in NARA and consists of 40 RGs. During the First World War, the US Army Signal Corps was given the responsibility of documenting American involvement, and its collection (RG 111) contains over 450 titles consisting of almost a half-million feet of film shot during the 1917 to 1919 period. Films such as Bayonet Instruction (1918) and Aviation Activities in the AEF (1919) are excellent examples. This particular RG contains over 12,000 more titles that cover Army maneuvers and battles up to the 1980s. The US Air Force Miscellaneous Series (RG 342) covers aviation and Air Force activities from 1909 through the early 1960s, with titles like Dedication of Wright Field (1927), USAF Goodwill Tour (1954) and TAC Operations, Homestead AFB (1962). Activities of the US Navy (RG 428) encompasses about 13,300 reels from before World War I to the early 1980s with titles like USS Holland Submarine Trials (1904), Invasion of Guam: Activity Aboard USS New Mexico (1944) and Poseidon Launch (1971). Motion pictures made by the US Marine Corps (RG 127) date from 1917 to the late 1970s and feature approximately 2,900 reels that include titles such as Soldiers of the Sea (1939) and Hawk Missile Firing, 29 Palms, CA (1962). All theaters of military operations during World War II, Korea and Vietnam are well documented within these and the other 36 RGs of this category. As mentioned earlier, donated motion pictures make up a significant segment of the overall collection. DMGs are usually personal or organizational motion pictures accepted by NARA under a "deed of gift." One such film is Carmencita, Spanish Dance (1894), a Thomas A. Edison Kinetoscope from the Thomas Armat Collection (ARMAT-ARMAT). This 115-year-old motion picture is probably the oldest film in the custody of NARA. Also included in this DMG category are three Columbia Broadcasting System (CBS) collections, the 3,400 films of the Ford Motor Company and 38 years worth of the Universal Newsreel. All together, there are 161 DMG collections that contain motion pictures for you to investigate. An excellent example of a DMG is the Harmon Foundation Collection. Real estate developer William E. Harmon established his foundation in 1922 to fund parks and playgrounds in growing communities and to provide loans for students. By the time the foundation ceased operations in 1967, its scope had grown to encompass numerous aspects of community and family life. The 300 or so associated motion picture titles (which date from 1930 to 1951) document the arts, crafts and societies throughout the world with particular emphasis on Native Americans, African-Americans, Africans, Mexicans and Chinese. Harmon Foundation films (H-HF) such as The American Indian: When the White Man Came and After (1933) and Ceramics Is a Disciplined Art: Use of the Potter's Wheel (1949) were donated without restrictions. At this point, I would hope that you'd like to know how to get your hands on all of this great footage. In an effort to allow enhanced access to all its holdings, including historic motion pictures, NARA developed the online Archival Research Catalog (ARC). This is the latest Web-based research tool that provides a portal to the content and physical descriptions of all its archival holdings. The stated goal is to have 95 percent of NARA's records (not just films, but everything!) input into ARC by 2016. At this time, about two-thirds of the holdings have been loaded into this digital super catalogue, but not all of these entries have comprehensive descriptions. Obviously, ARC is far from complete. It's dynamic, with content updates all the time. A subject that you research one week may have no hits and then have hundreds the next. In addition, ARC is not as easy to use as your favorite Web browser. The ARC main Web page, www.archives.gov/research/arc, has detailed information for your review. After you get your first list of results, find and select the Refine Search button. This will bring up the Archival Descriptions Advanced Search page. Make sure that the Limit Results button is set at 2,000, then select the Highlight Search Terms. These settings will ensure that you get the greatest number of hits on your subject and that all matching words will be highlighted in yellow. Now scroll down the page and you'll find a section called Type of Archival Materials. Since you are looking for film footage, deselect all the types listed except Moving Images. This will narrow your next set of search results to motion picture and video items. Then click on the Search button and you should find a cleaner list for your review. Once you've gone through the search results, selected some and read the descriptions, you'll probably end up with a list of titles and scenes that you'll want to check out. Unfortunately, your options for viewing the films at this point are limited to two choices. First, you can visit the National Archives II facility and view the titles in the Motion Picture, Sound and Video Research Room. If you want to do this, it's best to e-mail the staff in advance of your visit (mopix@nara.gov) to determine if a reference copy of your title is available on either film or videotape. If no reference copy exists, you may request that one be made, at no cost to you. The only downside to this process is that it may take several weeks. Your other option is to hire a private film researcher to make VHS or DVD reference copies of your selected titles and have them sent to you. For those of you outside a reasonable driving distance from College Park, this is a viable cost option when compared to the price of a plane ticket. A list of researchers is available at the NARA website (http://www.archives.gov/research/hire-help/). If you choose to visit NARA, you will find that many of the film collections have already been transferred to video and DVD. There are currently over 15,000 "research quality" videotapes and DVDs that are available for your review in the Research Room. Once you've selected the scenes you want, you'll probably want to make a copy. If all you need is a VHS dub, a self-help video duplication system is available for your use. For only $7.50 you'll receive a blank VHS tape and can use the dedicated dubbing decks for up to 90 minutes. If you want a different format, you can request permission to bring in your DVD recorder into the Research Room and make your own copy using the patch panels on the video study carrels. If you've identified a title that is not yet on video, but has a reference print available, the staff will pull it for you. Again, arrangements may be made for you to bring your own video camera to shoot the film images off the screen of a flatbed editor. If your needs require higher quality, the Research Room staff will assist you with the purchase of film or digital video copies through their vendor system. If for some reason you can't seem to find that scene you need, you have the opportunity to explore the one-third of the NARA film holdings that are not yet uploaded into ARC. The Research Room has a number of federal agency and donor created card catalogs, finding aids and inventory title lists for you to investigate. As I mentioned earlier, if you have a little more time than money, your search through the thousands of motion pictures in NARA can produce outstanding results. It is a viable option that is underutilized by the documentary production community as a solution to their stock footage requirements. By the way, remember that medium shot you needed of the pilot and co-pilot airborne in a World War I seaplane? You can find it in a film titled Naval Aircraft, NARA Catalog ID: RG 24.10, ARC #5911, on reel six--at the National Archives. Phillip W. Stewart is a video producer and an award-winning author of four motion picture-related reference books. His latest, America's Film Vault: A Reference Guide to the Motion Pictures Held by the U.S. National Archives, is available at Amazon.com. He can be reached at http://www.pwstewart.com or pws@pwstewart.com.